Room acoustics determine the quality of work. The increasing use of reverberant surfaces in architecture requires sound-absorbing preventive steps for the reduction of reverberation times. fecophon provides the solution: optimal sound-absorption in the room with maximum sound-insulation between adjoining offices. The uniform wall thickness of 105 mm achieves a sound insulation of up to Rw,P = 49 dB, whilst simultaneously absorbing sound on both sides. fecophon acoustic elements are finished according to your specification. With slits or perforation. With surfaces from melamine, laminate or wood. And on request with a uniform veneer. fecophon – Calm in the office. The cabinet as a wall, as a room divider or in front of the wall. Room-high or door-high. From wall to wall or as a single cabinet. Endless possibilities for your storage space. Whether wardrobe or row of files, whether suspended filing or pedant folders, whether tray with small compartments or drawer – everything is perfectly organised. And should your requirements and needs change, the internal organisation simply changes as well..
fecoschrank – The organised office cabinet. Nothing but glass. Single leaf system. The all glass system. Only fixed to the floor and ceiling with slender aluminium profiles, the vertically frameless glass sheets are reversibly fixed with transparent tape. 50 mm connection profiles allow the acceptance of building tolerances and provide a stable connection. 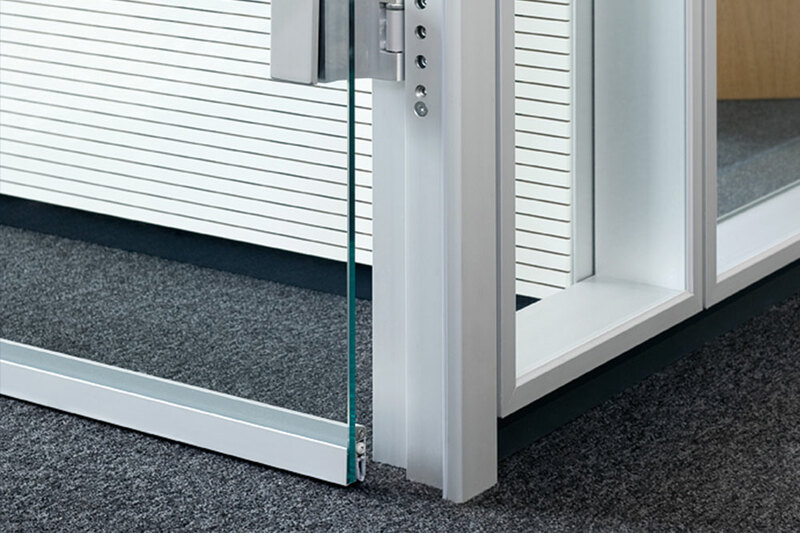 Corresponding element: The fecoplan system door-frame with integrated glass groove. Unique in the market due to its integrated aluminium technical panel for electrical installations and individual room signage. fecoplan – Nothing but glass. Single leaf system. 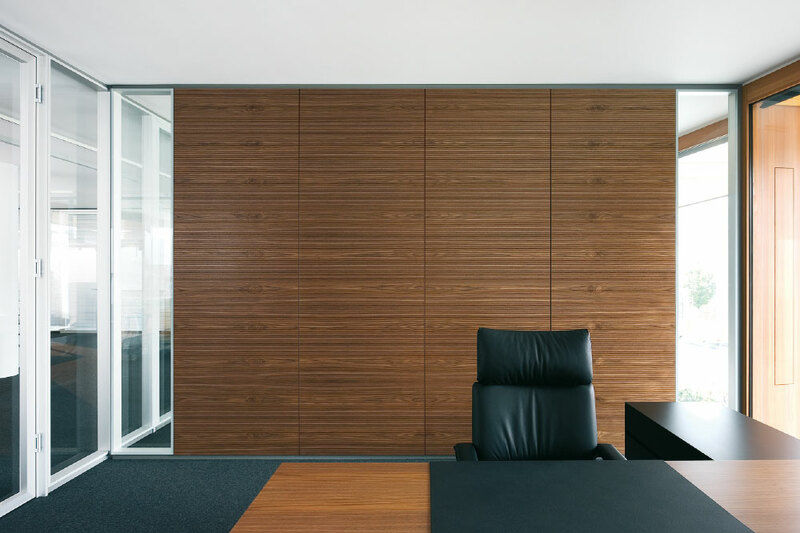 Its versatility makes the partition wall a classic: Melamine, laminate, veneer, textile or metal, standard or highly sound-absorbing, with or without protection against fire – whatever version you select, the visual impression is perfect. So is the acoustic quality, because even the basic version of fecowand achieves a soundproofing of Rw,P = 47 dB. Of course in all fire safety ratings up to EI90. 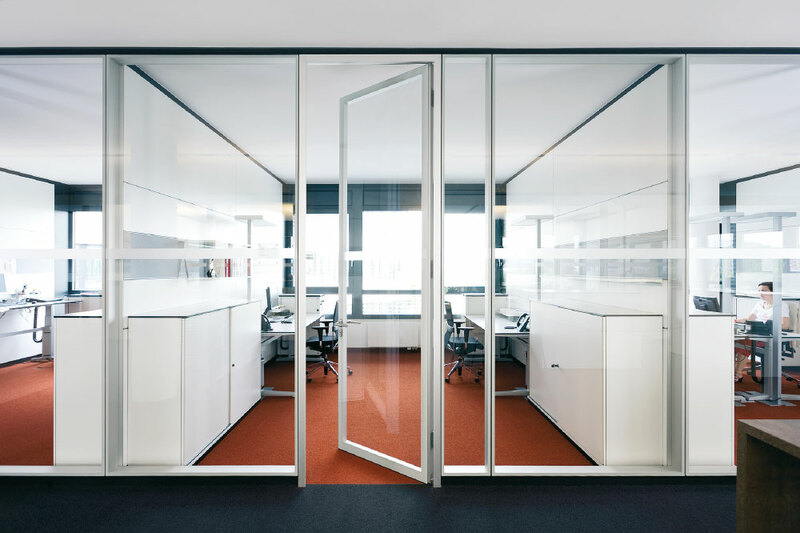 Only with the patented feco® clip system the wall panels are invisibly clipped to the partition wall’s uprights by means of clip rails running along the entire length. Be it as a flat single-pane or double-glazing – discreet, slender 20 mm aluminium profiles provide an appropriate framework for offices. Not a single joint disturbs the transparency. Due to its large cavity with, double-glazing achieves exemplary acoustic insulation results of up to Rw,P = 47 dB. Discretion, too, can be integrated on request. Maintenance-free blinds can be integrated in the double-glazing cavity with. fecofix – First-class overall conditions. Transparency and flatness are expressions of contemporary architecture. fecostruct is its equivalent in construction. Especially impressive are the flush-mounted panes of glass that are invisibly glued onto a concealed aluminium frame, which is only 20 mm wide. The result are completely level glass walls, which fascinate and are yet so natural. fecostruct – Frameless glass visions. feco® door elements are as varied as the entire feco® product range. Whether made from wood, glass or as a framed door – it is guaranteed that you find the right one. And the best thing is: The possible combinations are almost unlimited. It’s your choice. For example a fecostruct door with a fecofix glazing. Whatever you require, feco® makes it possible. Of course the doors abide by what you expect of the walls: first-class quality down to the last detail and highest acoustic standards. All officially approved with certification. fecoorga – The organised office wall.